As ‘resilience’ replaces ‘disaster risk reduction’ as THE strategy*, possibilities to consider human behaviour come into view. But human behaviour is complicated particularly for the humanitarian sector. 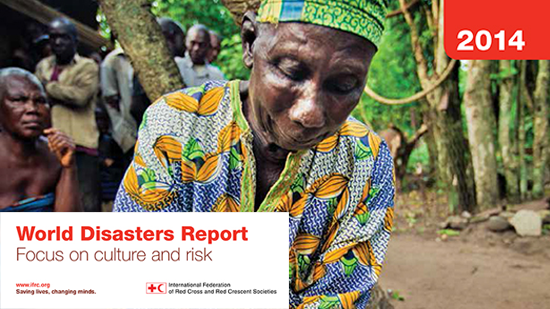 This year however, the IFRC, the tackles it head on in their annual World Disasters Report 2014, entitled Culture and Risk. Maybe not surprisingly, the WDR 2014 is a rather controversial report as it asks the humanitarian sector questions which the sector really struggles with. How do we make sure we do not impose our logic of risk on others? How do we engage with how real people (and their organizations) behave when faced with risk? How do we not force people to act in ways that are unworkable according to their cultures, beliefs, priorities and needs? How do we find a way to embrace “culture” when it both limits and empowers people when dealing with the risks they face .. ? I agree that we have to get this right! But suggest that we just don’t take culture into account as The Sectary General encourages, but instead make culture central. Simply by ensuring we understand the culture of the humanitarian sector, our own culture that we take around the world. And then above all respect the culture(s) our culture finds itself in! and here for the little WDR 2014 video! * The Hyogo Framework for Action (2005-2015): Building the Resilience of Nations and Communities to Disasters has been the world’s first comprehensive attempt to mainstream resilience into disaster risk management. Anna, great that you did this notice of the WDR, but why do such awful adverts come up on your webpage?? thank you for looking up the post, Terry! I have learned to ignore ads so hadn’t actually seen them, but yes – awful!